The Winterberry shop is a new venture for me and is still under construction. My original, hand-painted prints are available at the Turtle Gallery in Deer Isle, Maine and at the Green Lion Gallery in Bath, Maine. 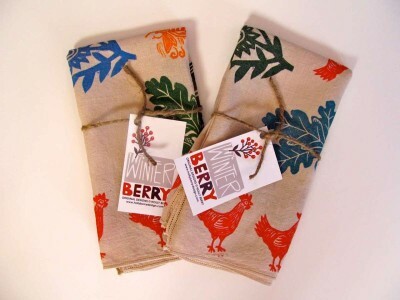 Below are some images of products I have been working on for Winterberry. Feel free to contact me (flossie@midcoast.com) with any questions or to purchase. Thanks! Add a bit of Maine to your kitchen! Hand-printed from an original linoleum block. 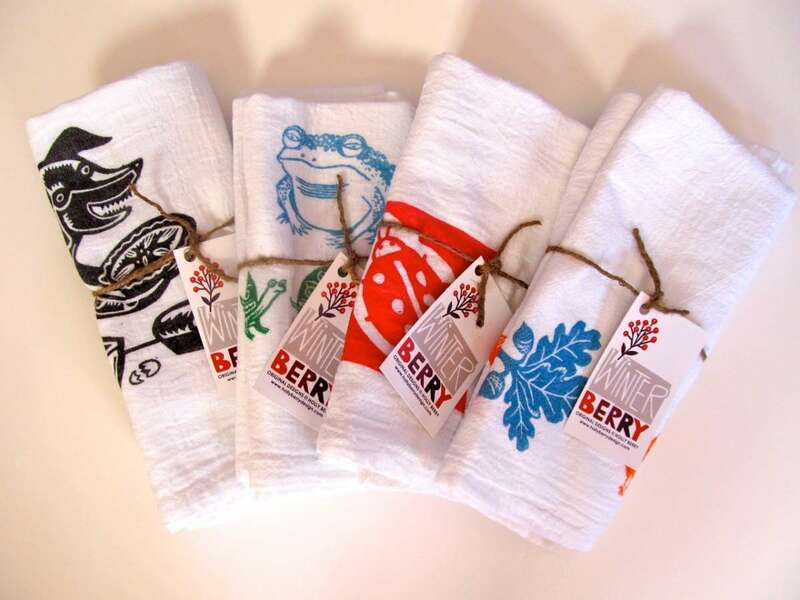 This one of a kind dishcloth is 100% cotton, machine wash and dry. 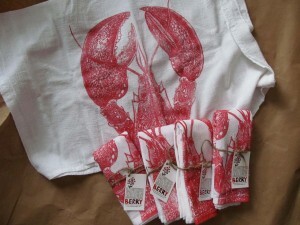 Original design from a linoleum block print showcasing an American Lobster rising from a seascape, inspired by the town of Friendship and the Maine coast. Commercially printed on 100% heavy weight cotton twill. Fully lined. Dry Clean Only. Hand dyed, hand printed 100% cotton napkin. 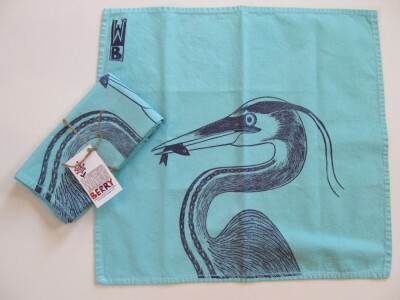 Original design cut and printed onto cloth from linoluem block image of a heron. Hand printed linen or cotton napkins of varied designs… original linocuts individually printed in random patterns – may include any colorful combination of flora and fauna images. Individual and unique 100% cotton flour sack cloths! Machine wash and dry. Original linocuts hand printed in variety of image and color combinations.